There's a bunch of features for high-speed networking on Linux kernel. This article introduce some of them, briefly. RPS is software implementation of RSS. 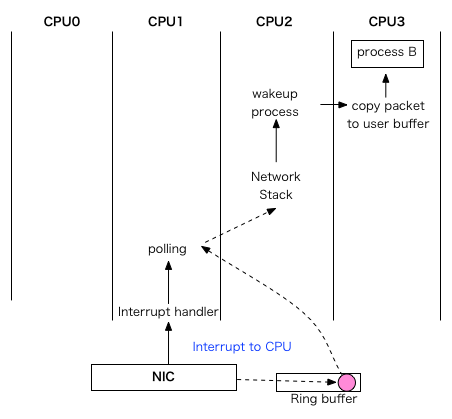 Which offers packet distribution functionality to mono-queue NIC, by kernel. It can configure CPU affinity per-device-queue, disabled by default. RFS is an extension of RPS, it updates RPS hash table(called rps_dev_flow table) to deliver packets to the CPU where application running on. It improves data locality, may increase datacache hit-rate. Also latency will decrease. Here's a graph which describes why we need it. To prevent TCP reordering, RFS doesn't update rps_dev_flow table directly. - It has another hash table for RFS called rps_sock_flow_table, RFS updates CPU number during call to recvmsg/sendmsg at first. - Then it updates rps_dev_flow table when NIC ring buffer is empty. Set rps_sock_flow table(it's global table) size, and set rps_dev_flow table(it's per-device-queue table). Accelerated RFS is RFS feature for multiqueue NIC. RFS calls device driver function named ndo_rx_flow_steer instead of update rps_dev_flow table. Also, RFS need to know which queue is assigned to which CPU, so they added cpu_rmap(CPU affinity reverse-mapping), it tells cpu:queue assignment information from driver to network stack. Currently, it only supported on Solarflare sfc driver, and Mellanox mlx4 driver. XPS is cpu:tx-queue assignment configuration interface for user. There's a command on ethtool which able to change weight between receive queue. There's a command on ethtool which change hash behavior. Even RSS hash function output is 32bit, NIC only uses lower few bits when lookup hash table due to table size(on ixgbe, 128 entry). On such condition, hash will easily conflict, flows required to share same entry on the hash table. 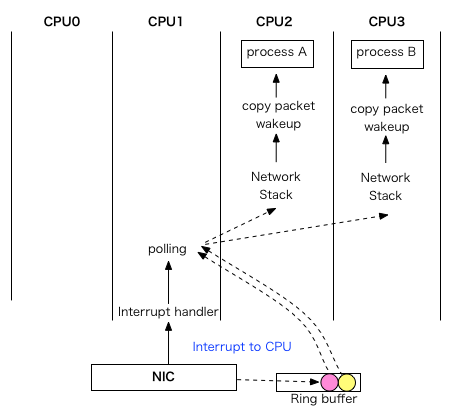 So RSS is good for packet distribution across CPUs, but not so good to steer specific flow. To resolve this problem, Flow Steering was produced. On Flow Steering supported NIC, device driver can insert 4-tuple or 5-tuple classification rule to the NIC. NIC will deliver packet to queue following the rule. NIC may uses hash table internally, but it's not easily causes collision, and software doesn't really need to think about hash table. Insert/update/delete classification rule and it just works. On Accelerated RFS article, I noticed sfc and mlx4 driver are supported this feature, both driver using flow steering for it, not RSS. In these driver, ndo_rx_flow_steer function parse the skb, extract 4-tuple or 5-tuple and insert the rule to the NIC. ixgbe also has flow steering function called "Intel Ethernet Flow Director", but not supports Accelerated RFS. It does almost same thing inside their driver, not cooperate with a kernel. There's generic flow steering rule configuration interface on ethtool, called RX NFC. Accelerated RFS configures Flow Steering automatically, RX NFC offers manual configuration feature to user. Thank you! It's veru useful article for me. There is nice company that offers cleaning services at good prices. Check it when you will have a time. Thank you for the info, question : how would i handle the following rule. ( Block 10.0.0.0/8 towards 2.2.2.2 for any port ) or ( Block from 0.0.0.0/0 to 2.2.2.2/32 source port 80 ). Im using a solarflare 40G card with nfc.